Celebrate the winter holidays with holly, berries and poinsettias! 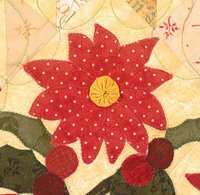 The "Peppermint Poinsettias" pattern has easy to read instructions complete with drawings to show you how to piece the block together and appliqué the flowers. The vase is a striped red & white fabric that when pieced, turns into a peppermint vase. The yellow centers of the Poinsettias are 3-dimensional "yo-yo's"! Block finishes 20" x 20" and would make a lovely holiday gift! Welcome to The Quilt Company! Arlene Stamper and Melissa Harris, a mother-daughter team, are the designers of all the patterns from The Quilt Company. 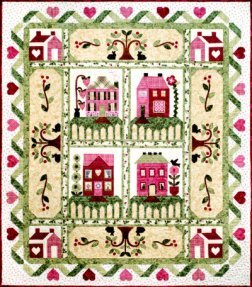 They started their business in 1999 with the Century Sunbonnet Sue quilt and now have over 100 patterns for sale. Their clients tell them that they have "happy" quilts and that their instructions are easy to read and follow. Their Tuesday Group quilt buddies quality test each pattern so they catch the mistakes instead of you! Enjoy your pattern! What got you to start quilting? The Quilt Company is a mother & daughter team of designers. Arlene started quilting in 1981 when a friend invited her to an adult education quilt class. Melissa helped Arlene make quilts as she grew up but got seriously into the quilt industry when they started The Quilt Company business in 1999. 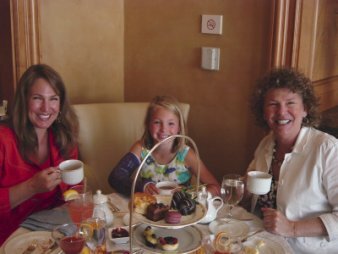 Melissa started to think about having a family and thought that a home-based business would be the way to go. As a result, Arlene and Melissa formed The Quilt Company and have been going strong ever since! We both agree our favorite pattern is Heart & Home, a Block of the Month pattern that we designed a few years ago. Melissa has an 8 year old daughter, Lauren, so there isn’t a lot of free time! We both love afternoon tea. We also take an annual retreat after Fall Quilt Market to a Bed & Breakfast in our nearby mountains. We both love home decorating & change our home décor by the season. Too many to recount them all! The quilts that we have made for family members have special memories. For weddings and births, our extended family gets together and makes quilts. We gather together at a family member’s home, then the cutting & sewing begins and lasts into the evening. We work all day together and then usually we take the blocks home and finish up the quilt for them. These quilts are treasured heirlooms in our family. Melissa and Arlene live within 20 minutes of each other as the crow flies. So we get together all the time as well as for parties and celebrations. We just had a July 4th party at Melissa’s house. Family and friends came to eat, swim and watch the local fireworks from the backyard. Our husbands golf together so unfortunately, we are golf widows. Lauren entertains us at every turn, we go to her karate class, watch her jump in the pool and go to see movies like “Shrek” & “Marmaduke” with her! Lauren is already helping The Quilt Company by stuffing patterns too! 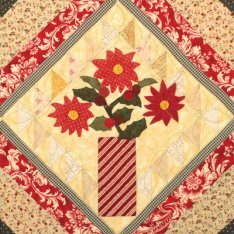 The "Peppermint Poinsettias" pattern has easy to read instructions complete with drawings to show you how to piece the block together and appliqué the flowers. The vase is a striped red & white fabric that when pieced, turns into a peppermint vase. The yellow centers of the Poinsettias are 3-dimensional "yo-yo's"! Block finishes 20" x 20" and would make a lovely holiday gift!